A very well-presented and spacious 3 bedroom bungalow with approximately 4 acres (1.61ha) of level pasture land set on the edge of a hamlet location with far-reaching countryside views. Situation - 5.3m 2.98m (17'5" 9'9") - The property is situated on the edge of the village of Warbstow which has a primary school. The market hamlet of Hallworthy lies 2.7 miles to the south west where there is a public house, filling station and shop. Approximately 10 miles to the south east is Launceston. The main A30 dual carriageway at Kennards House lies approximately 8 miles to the south east from where there is easy access to the east to Okehampton and Exeter, and to the west to Truro. Recreation - Water - Sailing is available at Siblyback and Roadford Lakes, Padstow, Fowey, Plymouth, Newton Ferrers, Salcombe, Dartmouth and various other harbours along the south coast. There are delightful beaches on the North Cornish coast including Widemouth Bay, Trebarwith, Polzeath, Harlyn Bay and Constantine Bay. Horse Riding & Walking - Horse riding on quiet country lanes in the area. The North & South West Coast Path also offers scenic walking and further walking and riding are available on Bodmin Moor and Dartmoor. Golf - Golf courses can be found at Launceston, Kennards House, Tavistock, Holsworthy, Saltash, Whitsand Bay, Looe Bindown and St Mellion. Communications - Road - The A30 from Launceston provides easy access to Exeter and the M5 motorway. The Property - A well-presented and spacious 3 bedroom bungalow set in a quiet, rural location with approximately 4 acres (1.61ha) of land with far-reaching countryside views. The property briefly comprises: Entrance Hall, Sitting Room, Breakfast Room, Kitchen, Utility Room, Conservatory, Integral Single Garage, Family Bathroom, Master Bedroom (En-suite) and 2 further Bedrooms. LPG gas central heating and double glazing. The land is either accessed directly from the garden, through a pedestrian gate, or from a gate off the driveway. The bungalow currently receives a feed-in tariff (FIT) from solar panels on front and rear roofs. Conservatory: - 3.84m x 2.98m (12'7" x 9'9") - Double doors lead to decking and garden. Integral Single Garage Off Utility Room: - 5.30m x 2.98m (17'5" x 9'9") - Up-and-over single door, power and light connected, Worcester boiler. Family Bathroom: - 2.4m x 1.8m (7'10" x 5'11") - Bath, wash hand basin and WC. En-Suite Shower Room: - 1.82m x 1.65m (6'0" x 5'5") - Shower cubical, wash hand basin, WC and towel rail. Bedroom 2: - 3.48m x 3.26m (11'5" x 10'8") - Double built-in wardrobe. Bedroom 3: - 3.16m x 2.50m (10'4" x 8'2") - Double built-in wardrobe. Garden & Grounds - 2.98m x 3.84m (9'9" x 12'7") - Gravel driveway parking and turning area with an integral Single Garage 5.3m 2.98m (17'5 x 9'9). Level lawns wrap around 3 sides of the property with flowerbed borders and mature shrubs. Directly off the conservatory is the recently laid decking proving a perfect place for al fresco dining. Beyond the garden lies the 4 acres of pasture land, which can be accessed from the garden, through a pedestrian gate, or through a gate off the driveway. Steps leading up from the garden take you to the Summerhouse 3.84m x 2.98m (12'7 x 9'9) and Greenhouse 2.4m x 2.0m (7'10 x 6'7). The Land - Accessed off the driveway, or through the pedestrian gate from the garden, the land extends to approximately 4 acres (1.61ha) and lies to the rear of the bungalow. The level land is enclosed within hedges and stock proof fencing. Tenure - For sale freehold by private treaty with vacant possession on completion. The property is sold subject to and with the benefit of all outgoings, rights of way, easements and wayleaves there may be whether mentioned in these general remarks and stipulations or particulars of sale or not. 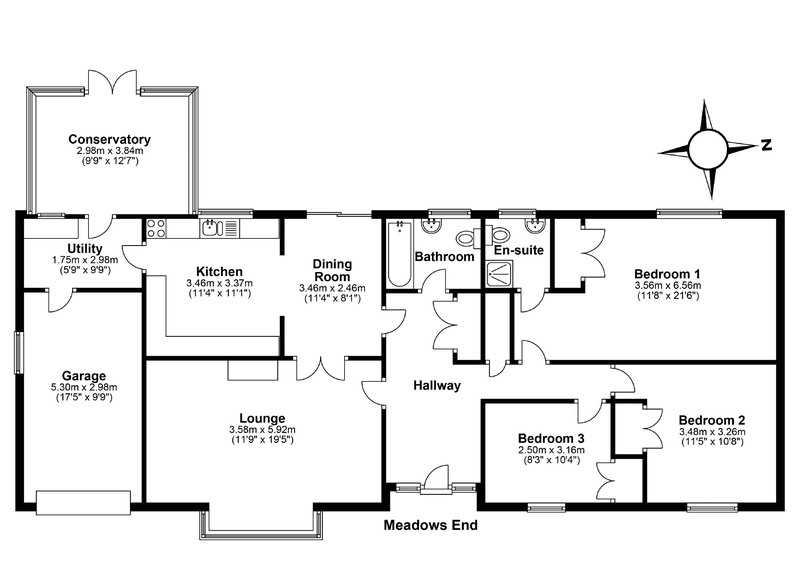 All figures, floor plans and maps are for guidance purposes only. They are prepared and issued in good faith and are intended to give a fair description of the property but do not constitute any part of any offer or contract.